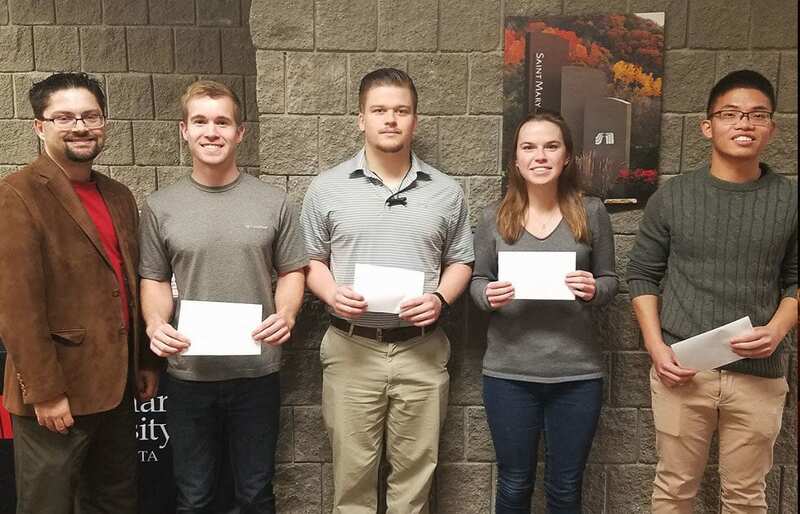 WINONA, Minn. — On Nov. 3, four Saint Mary’s University students competed in MinneAnalytics’ third annual analytics event, which is designed to allow students to explore real-world data while enhancing and showcasing their skills. This year’s competition focused on predicting voter turnout for the midterm elections in Minnesota. Students had multiple weeks to analyze data before presenting their findings to judges from the analytics community at the main event. Student participants had a series of six elevator-pitch-style presentations about their analysis and were graded on different categories, including creativity, accuracy of the model, and presentation skills. Cash prizes were awarded to top teams in each division. Saint Mary’s team consisted of business intelligence and analytics majors Nicholas Marshall, Jacob Petraitis, and Emily Seykora and physics major Toan Tran. The group presented a model in which they asked a voter a series of 20 questions relating to topics like healthcare. From their responses, the students predicted the likelihood that the respondent would vote in the most recent election. Although they did not win the competition, the Saint Mary’s team scored highest in creativity of their model and earned prize money. About 30 schools in total participated in the event. Seykora, a junior at Saint Mary’s, said the experience was valuable because it provided a way to showcase what students have learned in class, while also getting constructive feedback. “We saw how valuable having a business perspective can be to the overall success of a project,” she said. Aside from the competition, MinneAnalytics has funded a second $1,000 scholarship for a business intelligence and analytics major at Saint Mary’s. MinneAnalytics, located in Eden Prairie, is a nonprofit organization dedicated to serving the data science and analytics community in Minnesota, the Upper Midwest, and beyond by providing accessible, authentic, and engaging events.